Whether you are looking for gift for a friend or family member a living plant or tree is just perfect! It is a thoughtful gift that is environmentally conscientious and keeps the holiday warmth glowing well beyond Thanksgiving, Christmas, Hanukkah, Kwanzaa, New Years, etc. You can even buy living gift plants and trees online and have them delivered to your recipient. You can’t beat that no hassle convenience when you already have so much going on this time of year! 1. Pick out a plant appropriate for the giftee’s location and climate. Pro Tip: If you X out of the growing zone tab at the top right hand side of the page here you can enter a zip code to quickly and easily determine their growing zone. 2. Think of color, texture, and look. What will your family member or friend like? Don’t overthink it and go with your gut. You’re probably right on track. Besides it is hard to go wrong with a living gift! 3. Size and this is a big one. Check the mature size to be sure it is appropriate for the recipient’s home or garden. 4. Are they likely to keep it in a pot or plant it in the ground? If they are likely to keep their living gift in a container outdoors be sure that you purchase a plant that grows in an area at least 1 growing zone colder. So, if they are in a zone 6b be sure to buy a plant that will grow at least into a 5b. This juniper tree has stunning blue green foliage year round. It maintains a lovely Christmas tree shape without pruning. 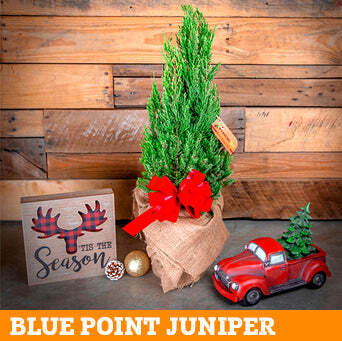 The Blue Point Juniper is drought tolerant, deer resistant, and low maintenance. 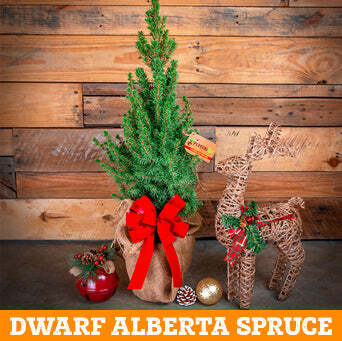 Dwarf Alberta Spruces are compact trees that are great for topiary or in containers for an elegant look. These small pyramidal trees have dense, fragrant green foliage. The Dwarf Alberta Spruce requires good air circulation. Avoid planting in humid climates. <Great for someone looking for a large evergreen with a classic Christmas tree shape, this hardy, drought tolerant, fast grower has been a landscape staple for years. It requires no maintenance once established so it is great even for a novice gardener. A pretty houseplant with holiday flair, the Norfolk Island Pine resembles a pine tree but is soft to the touch. This living gift makes a perfect centerpiece on the table and adds a touch of beauty and life anywhere in your home. After the holidays put this plant near a bright window and mist the foliage every few days to enjoy it for years to come. In fall to early winter an abundance of unique double bicolor blooms turn this pretty evergreen shrub into an absolute masterpiece. White lacy petals are kissed with a blush tint and magenta edges. This stunning bush is low maintenance and disease resistant. A lovely holiday gift with fresh scent and functionality, Rosemary is great choice for just about anyone. Impress those you love with a thoughtful and unique present. Ditch those cut flower bouquets that die in a few days. Keep the cheer going for years to come with a living gift. Shop our online garden center for a large selection of plant and tree gifts.